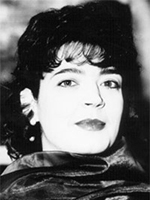 Hilary Summers is a Welsh dramatic contralto. She has performed for many soundtracks, and many Michael Nyman works. She is a long-term Divine Comedy fan, and she introduced Michael to the band in 1997, when The Divine Comedy played the London Royal Festival Hall. After that meeting, Hannon and Nyman worked together on a show for the Edinburgh’s Flux Festival on which Hilary performed with The Divine Comedy and the Michael Nyman Band. In 1998 for the album Fin De Siècle, she contributed to the songs ‘Sweden’ and ‘Commuter Love’. On several occasions she joined the band live. The same year, she also provided vocals for the main theme of The League Of Gentlemen series, composed by Joby Talbot. She also performed with Joby at his concert at the Almeida Theatre, in 1999. In 2005, she worked again with Joby for another of his soundtrack, The Hitchhicker’s Guide To The Galaxy. She is to be heard on the opening version of ‘So Long And Thanks For All The Fish’, while the closing version of the song is sang by Neil Hannon. She once again performed live with Joby Talbot at his Queen Elizabeth Hall concert to celebrate the release of his albums Once Around The Sun, The League Of Gentlemen’s Apocalypse, and The Hitchhicker’s Guide To The Galaxy.